It may be chilly out there: perhaps a little frosty underfoot or misty in the distance, but all this atmospheric weather makes for a wonderfully romantic setting, especially in the Lake District! Take the opportunity to visit one of Cumbria's many beautiful, historic locations at this gorgeous time of year. 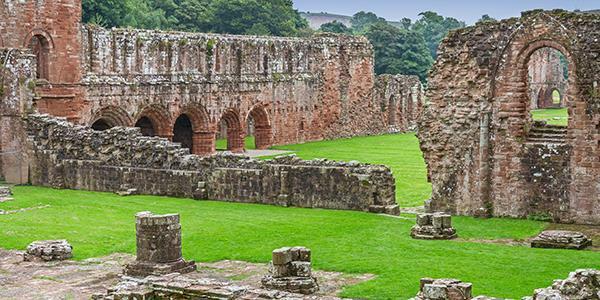 Down towards the tip of the Furness Peninsular, you will find the picturesque Furness Abbey, just a 30 minute drive from Merlewood in a peaceful, romantic valley amid Lake District countryside. With architecture dating from the 12th century, the abbey was founded by soon-to-be King of England Stephan in 1123. What was once one of the richest Cistercian monasteries in England is now cared for by the English Heritage and sits in impressive ruins on the outskirts of the town Barrow-in-Furness for all to enjoy. Though there is evidence that the area was inhabited long before hand, the Furness economy really took off during the Middle Ages when the monks of the abbey discovered and smelted iron ore deposits. By the 15th century it had become the second wealthiest and most powerful abbey in England, following only Yorkshire's Fountains Abbey. You can tell by the extensive ruins today that the abbey was a large, Gothic structure. Explore the tranquil site to your heart's content. You can wander the remains of the ornately decorated chapter house, and see what is left of the cloisters. There is a small visitor centre which includes a little shop and exhibition. Here you can learn more about the history of the abbey and see some of the permanent carvings and effigies on display. Recently a crozier, which is a kind of hooked staff often carried by a bishop, and a lovely jewelled ring, were excavated amongst many other medieval treasures from the grave of an important abbot. The abbot appears to have been buried as early as the 1150s and it's unusual but lucky that the burial site remained intact throughout the 16th century Dissolution of the Monasteries and subsequent robberies. Both of these fascinating items are now on display at the abbey, so don't miss them! Aside from the abbey's incredible atmospheric beauty, there is one other reason it has romantic associations, and this one is a bit of a spooky connection. According to popular belief there are actually a number of ghosts wandering the rugged walls, and one of these is the spirit of a young woman. There have a been a number of recorded sightings and the story goes that this girl was a squire's daughter who met her lover at the ruined abbey. One day her love went to sea and never returned, and so the girl wanders the ruins of the place they used to visit together. Around the site there is actually a walk named for the young girl, so you can walk in her footsteps if you want to. It is called My Lady's Walk. If you want to continue exploring the great outdoors there are a number of wonderful walks you can pick up from the site – walks leaflets can be found at the Furness Abbey visitor centre. The abbey actually sits on Cumbria's Cistercian Way which is a long distance path that connects Grange-over-Sands with Barrow-in- Furness. If you'd prefer to have a lazy day and just enjoy each other's company you could instead visit the nearby coffee shop, Abbey Mill, which is a little family-run establishment that serves breakfast, lunch and afternoon tea. It is open Wednesdays to Sundays from 10 am – 4 pm. They also have a number of local walks detailed on their website here. 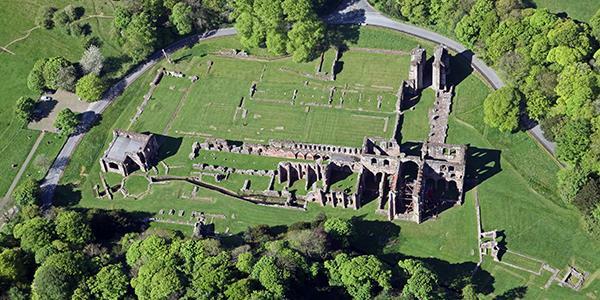 Furness Abbey is open at different times depending on the season, so do check the English Heritage website before setting off.